I was truly surprised when I saw my DIY banquette seating tips come up on msn.com! 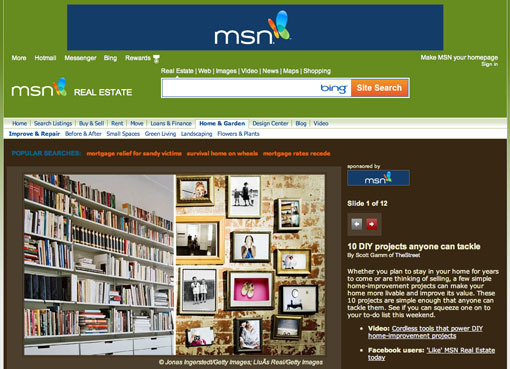 I had given some design tips on how to build your own banquette seating on Mainstreet.com, and I was so excited to see my tips on the homepage of msn real-estate! See below for the written step by step directions…. If you have the space, a very popular and desirable look is having “built-in” banquette seating for your breakfast area. This adds coziness and warmth to your eating area and adds that extra storage we all need! Under a window is an ideal spot for this and we all know that not enough homes come with window seats! You can go to Ikea, Lowes or Home Depot to purchase the cabinets. Some of these stores will work with you for your exact dimensions so bring your measurements to pick the right cabinet widths. I recommend a 15″ cabinet height at least. In order for the doors to open, you need to raise the cabinets off the ground. Otherwise they will scrape the floors. You can do this by laying 2×4 planks of wood across the span of where you want the cabinets to lay on (similar to a train track). Install cabinets on top of the 2×4’s and secure them to the existing flooring with construction adhesive and screws. Add trim work on face of the 2×4 for a finished look. I recommend using a 1×4 toe kick to be painted the same color as the cabinet. You can purchase these at any home improvement store. 3. Add Seat Cushion – Another DIY Project or you can take to an upholsterer to make the cushion..
Purchase Fabric – you can to to JoAnn Fabrics for tons of fabulous fabrics. Measure the bench to determine how much wood you’ll need for the seat and purchase plywood from a home improvement store. They will cut this for you. Cut the poly foam with a serrated knife to fit on top of your wood and use wood glue to glue the foam to the wood. Once the glue is dry, cover the foam with batting and trim to fit. Use a staple gun to staple the batting to the underside of the wood. Take extra caution to make sure the batting is smooth. Lay the wood, batting side down on top of your upside-down fabric. Fold the fabric like you are wrapping a present around the batting to ensure no loose corners. Pull the fabric super tight and staple to the wood with a staple gun all around the underside perimeter. Cut excess fabric and secure the cushion to the bench seat.